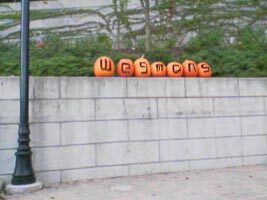 Anyone who reads this blog knows I am a Wegmans fanatic. Enough so that I even joined the Wegmans fanatic group on Flickr. Now Aaron has moved from working at one of the stores to corporate Wegs. He is one of their newest marketing coordinators. Yahoo! I can never set foot in Tops again. Hey, I joined that group last week too. I like to embarass my husband by taking pictures in the store while we're shopping. He hates that! Congrats, Aaron, on the new gig! Yay congrats to Aaron! That is neat! awesome. Can he use his influence to get them to buy more method products? My husband is a manager for a rival supermarket for over 25 years........i sneak to wegmans!! My comment is unrelated but I saw something today I thought you might enjoy. I know how you like packaging and I really enjoyed this tea packaging because it just cuts to the chase and leaves me the consumer not having to wonder which tea to drink for which outcome. no wegman's here in monkeyville either. Since moving from Buffalo, I miss Wegman's big time! Kroger does NOT compare. What's so special about Wegmans? I live in Toronto, but go to Buffalo every now and then to visit friends. Im curious now, and want to check one out.